FREE sample of Finish Power & Free! Click here to request a free sample of Finish Power & Free! FREE sample of Garnier Fructis Marvelous Oil! Click here for a free sample of Garnier Fructis Marvelous Oil! FREE Ban Refresh cooling body cloths! Click here to request your FREE sample of Ban Refresh body cloths! FREE sample of Finish dishwashing tablets! Click here to request a free sample of Finish dishwashing tabs! Baby Leggings wants to give you a promo code for 5 free baby leggings (a $50 value) 70+ Styles! It’s as easy as 1-2-3! Click on “Shop Now” and select any 5 baby leggings you like. Once you have made your selection, you can scroll down or view cart. Enter the promo code “BABYSAVINGS” and we will deduct 100% off the cost of the 5 pairs of baby leggings – all you pay are the SP&S fees! Remember: the promo code is “BABYSAVINGS” and you can use it more than once – just open a new browser window each time you do. These Baby Leggings make great gifts. Selections dwindle quickly, so get yours today! 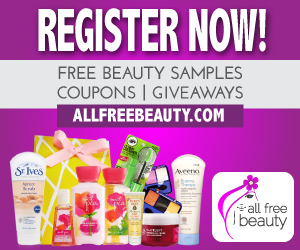 FREE beauty samples, coupons, giveaways and more! AllFreeBeauty offers all things beauty – glamor tips, fun pictures and most of all Daily Deals, Coupons and Free Samples! FREE sample of Crest 3D Whitestrips! Click here to request your FREE sample of Crest 3D Whitestrips! Â Enter code 9K2P on the first page to get to the form.